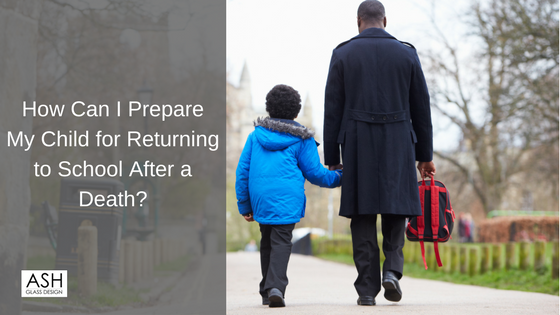 How Can I Prepare My Child for Returning to School After a Death? Are you worried about your child returning to school following the death of a loved one? It’s important for children to settle back into the routine of school and seeing their friends after suffering a loss, however you may still be feeling uncertain of how they’ll cope once they return to class. Many parents worry that they’re sending their child back too soon; that their minds may not be focused on what they are doing in class, and that they won’t know how to deal with other children asking how they are. In my experience as a child bereavement counsellor, I’d like to reassure you that many children are glad to have a little bit of focus and normality in their lives after experiencing a loss, and going back to school can be a welcome distraction. However, below I’m going to give you some advice in order to help fully prepare your child for returning to school after a death in the family. The first thing I’d recommend doing before your child returns to school is speaking to your child’s teacher (or perhaps your child’s guidance counsellor, if they are in high school). Explain to them what has happened and how your child is currently coping. The teacher may opt to speak to the class before your child returns, just so their fellow classmates understand that someone has died and that they’ll maybe need to lend extra support to your child, as it can be difficult coming back to school after such an event. The children may even have some questions themselves, which the teacher can help get out of the way before your child returns, as your child may just want to play with their friends and forget everything for a while without having to answer lots of questions. As a teacher myself, I’ve had to explain to my class on a few occasions why one of their classmates is off, and usually they know what has happened. I let them ask questions and we also try to come up with ideas of nice things we can do to help our friend when they return to school. TIP: If you are a teacher reading this and are worried about what to say to the child in fear of upsetting them, don’t be; it’s better to acknowledge and say something, rather than say nothing at all. Remember, the worst has already happened. It’s also important to talk to your child and see how they are feeling about going back to school. Depending on how they are coping with the loss, they may be keen to return to class quickly and see their friends – or, they may keep asking to stay home and need a little more encouragement. Some children may even need some boundaries set; children like boundaries and if they are taken away then it can be another huge change and they may not be entirely sure how to deal with that. If your child is anxious or worried about returning to school, a good idea is to tell them they can talk to the teacher and if things get too much at any point, they can come home. If you’re unable to do this due to work commitments, try to get a friend’s house on standby, just in case. Try to keep things as normal as possible for your child, and let them know who they can speak to at school if they are upset at any point. Reassure them that their teachers should be understanding and will speak to them and acknowledge what has happened. You may be wondering if your child would benefit from seeing a bereavement counsellor, however this really depends on the circumstances and how close your child was to the person who has died. It may also depend how others in your family are coping with the recent loss. My usual advice is that if your child has lost a parent or sibling, a counsellor could really help them to cope and to open up about this huge change in their life, whilst allowing them to work through their grief in a safe environment. TIP: The website Winston’s Wish is a great resource for helping to support your child with various aspects of their grief, including returning to school. Thank you for reading, and I hope you’ve found this blog post helpful when supporting your child in returning to school and getting back into a routine. It’s so important for children to get back to a bit of normality, even though this may seem difficult at first. Remember, the school should be happy to speak to you and do everything they can to help your child settle back into classes without too much disruption. 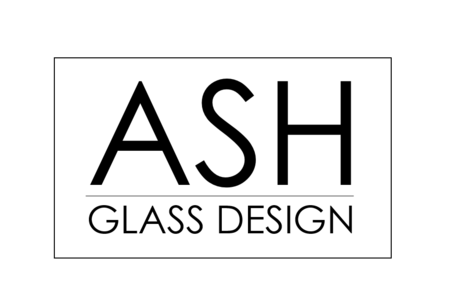 If you’re looking for ideas for what to do with your loved one’s ashes, you’re welcome to read our ebook: ‘6 Things You Can Do With Your Loved One’s Ashes’. 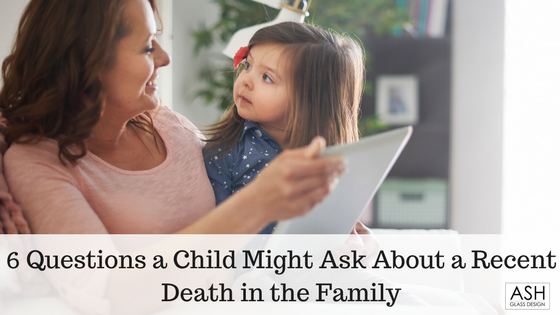 Are you unsure of how to answer your child’s questions about the death of a loved one? If you’ve recently suffered a loss in the family, you have my deepest sympathies. Explaining about death to a child – especially if they are particularly young – can often be a tough task, and you may be preparing yourself for many questions. Children tend to have a natural curiosity about the Great Unknown, and especially when it comes to death, they will want to know what it feels like, if the loved one is ever coming back, what happens to the loved one now, and even if they are going to die, too. Sometimes knowing what to say to these questions can be incredibly difficult, and you may be worried about saying the wrong thing at such a delicate time. Below, I’m going to use my experience as a child bereavement counsellor to help talk you through some of the most common questions children ask about the death of a loved one, and the best way to respond. 1. Is death like sleeping? Regardless of what you believe, it’s important not to refer to death as if your loved one is simply sleeping, as this idea can be particularly frightening for young children. It’s easy for a child to become confused and acquire the fear that they are going to die in their sleep. As you can imagine, this leads to all sorts of problems, including the child avoiding sleep altogether! I find the best way to explain death is by saying that we all need our bodies to live, and when our bodies become ill and medicine can’t help to make it better, they will eventually just stop working. And when our body no longer works, it means we are dead. As for what happens after death, it’s okay to say that you don’t know, but to share your beliefs or what you’d like to think happens after a person has died. Ask your child what they believe happens, and allow them to take comfort from that belief, if it helps. 2. Will they come back? This is another common question, and one I hear a lot, particularly from younger children who sometimes have difficulty accepting that death is final. In this case, it’s vital to be very clear about this from the get-go. My advice is to tell them that no, the loved one won’t be back; no matter how much we miss them, or try to get them back, they won’t ever be coming back – not in a week, a month or even a year. ‘Waterbugs and Dragonflies’ by Doris Stickney is a good book to read to young children about this, as denial is one of the stages of grief, and if they’re going through that stage, it may make it more difficult for them to understand the finality of death. 3. What happened to him/her? I understand that this question can be a particularly difficult one to answer, but I always advise being very truthful here, as your child will have picked up bits and pieces from conversations and from what you’ve already told them. Keeping this information from a child, or telling them something other than the truth, can be particularly hurtful if the child finds out from someone else, such as from another child in the school playground. You can be basic about the information to start with, as long as that information is honest, and gradually give them more details when they ask, or if you think it’s needed. TIP: I know that answering honestly can be particularly difficult in the case of a suicide, so read my blog post on the subject for more guidance. 4. Will I die, too? The best thing to say here is to explain that we will all die at some point in our lives, and most of the time it’s when we are old – however, there are times when younger people die due to accidents or illnesses. It’s important to explain here that just because someone they know has died, it doesn’t mean they are going to die, too. Tell them that they are healthy, and by keeping themselves safe, there’s no reason why they can’t live long, full lives. 5. Is it my fault? This may seem like an unusual question to ask, but actually it’s very common for children to think the death of a loved one or family member is their fault; maybe because of a thought they had, or something they said to the loved one who has died. Because of this unfounded guilt, it’s absolutely crucial to stress that it’s not their fault, and to explain the reason why the person has died – that way, there’s no doubt whatsoever about any of the blame falling to them. What if my child hasn’t asked any questions? Sometimes children don’t like to ask the questions above, or don’t know how, and are very upset. Other times, they might have lots of questions, but are hesitant about asking someone close to them for fear of hurting/upsetting the person further. I’ve often found that speaking to a less immediate relative or close family friend can help a child open up and ask the questions they’ve been holding in. It turned out he had been wondering all of these things, but simply didn’t know how to ask or how to bring it up in conversation. It may be that giving your child the opportunity to ask questions or even posing some back to them will help them to finally get the answers they need. What if I don’t have the answer to their question? If you don’t have the answer to a question, it’s okay to say so. If it’s a question you can find out the answer to, just say you’ll get back to them when you’ve found out. If not, then you could refer to what other people believe, or what you believe yourself – and ask them what they think. I’m very sorry for your loss, but hope this blog post has gone some way to providing you with some much-needed guidance when answering some of your child’s biggest questions about the death of a loved one. Every child experiences grief differently. Your child may find it difficult asking some of these questions, in which case they may prefer to talk to a less immediate family member or friend – or you could try posing some questions back to your child to help them open up.